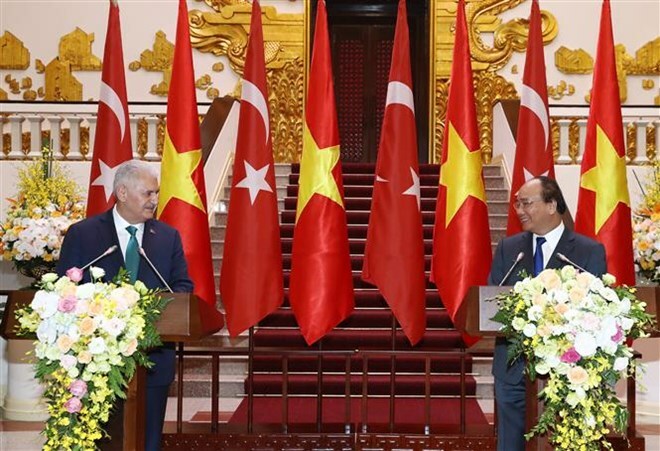 Hanoi (VNA) – Prime Minister Nguyen Xuan Phuc and his Turkish counterpart Binali Yildirim discussed measures to promote trade and investment partnership between the two countries during their talks in Hanoi on August 23. Lauding the outcomes of the two countries’ Joint Committee’s seventh meeting in July, the two PMs stressed their determination to raise two-way trade to 4 billion USD in 2020 through boosting trade and investment promotion activities. The Turkish PM suggested that the two sides consider cooperation possibilities in the defence industry. Welcoming the Turkish businesses accompanying PM Binali Yildirim, PM Phuc said that he hopes enterprises of Vietnam and Turkey will make use of their meetings during the visit to boost the trade of goods, investment, people-to-people exchange and tourism between the two countries. He proposed that Turkey recognise Vietnam’s market economy soon, and asked that Turkey remove a number of unreasonable taxes and fees on Vietnamese products such as footwear, fibre, belts, air conditioners and cell phones. The two sides agreed to work closely to enhance cooperation in transportation, especially aviation and maritime affiliation, science-technology, culture-education, security-defence and people-to-people diplomacy. PM Binali Yildirim suggested that the two countries provide scholarship to students of each other and encourage their students to study the language and culture of the other country. The two PMs concurred to collaborate closely to organise activities to celebrate the 40th anniversary of bilateral diplomatic ties in 2018. On political ties, the two sides agreed to strengthen delegation exchange and encourage the cooperation between their ministries, sectors, localities and friendship organisations. They pledged to continue with coordination and mutual support at international forums. The Turkish PM asked for Vietnam’s support of Turkey’s bid for a seat in the UNESCO Executive Board for the 2017-2021 tenure, while showing backing of Vietnam to become a non-permanent member of the UN Security Council for the 2020-2021 term. The two sides also shared concern on rising terrorism and affirmed their support for regional and international efforts in anti-terrorism. Regarding the East Sea issue, PM Binali Yildirim affirmed support of Vietnam’s efforts in maintaining stability in the region in general and the East Sea in particular, as well as the stance of Vietnam and ASEAN countries on settling disputes in the East Sea by peaceful methods via dialogues and with respect for international law.